In a not-too-distant future a spaceship filled with slaves and their handlers is beached on Earth. They are introduced into the American culture with names like Sam Francisco and learn the ways, good and bad, of humankind. 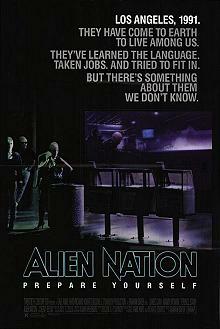 Basically Alien Nation is a science fictional crime story. A prejudiced street cop Sykes (James Caan) volunteers to partner up with an accelerated-promotion alien detective (Mandy Patinkin) who he renames George. Despite George's innocent desire to follow the rules of his new society and job, the two men investigate killings related to the death of Sykes last partner. Yes, this is an old story. It is revamped a little to have an alien instead of some other marginalised group member. It gets a little humour from the alien nature of the so-called "newcomers". They look a little different, but they are similar enough to interact sexually with humans. They metabolise food differently, so they eat different, uncooked foods, and they get drunk on soul milk. Alien Nation was successful enough to spawn it's own three-year series and is worth a look, its characters and themes still speak to a contemporary audience.